The Virtual Trillium Trail is a new kind of desktop virtual reality application that crosses over into the area of geospatial, educational simulations. Visual fidelity significantly impacts intrinsic learning, activity in situ, and knowledge gained, independent of other factors. The main empirical contribution of this report is on the impact of the user interface design parameters of graphical fidelity and navigational freedom on learning outcomes. A planned orthogonal contrast, Two-way ANOVA with the factors of Visual Fidelity and Navigational Freedom—both scaled, and set to high and low levels—shows significant impacts on the variables of Salient Events, a proxy for discovery-based learning, and Knowledge Gained, as measured between a pre-test and a post-test. 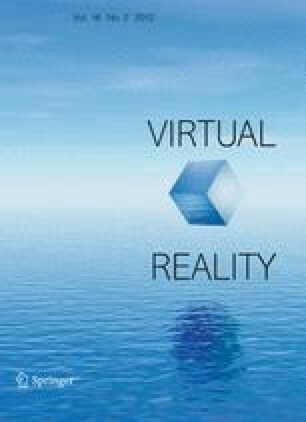 Thus, there is strong empirical evidence to support the use of desktop virtual environments, built with high-fidelity, photo-realistic, and free navigational game engine technology, as educational simulations for informal education. The high-level Visual Fidelity combined with the high-level Navigational Freedom condition showed a mean learning gain of 37.44% and is significantly superior to the low-level Visual Fidelity, low-level Navigational Freedom condition, ceteris paribus. The author wishes to thank Dr. Susan Kalisz, Professor of Biology at the University of Pittsburgh; Ms. Gabi Hughes, Coordinator of the Environmental Education Program, Audubon Society of Western Pennsylvania; and all of the teachers, parents, and students who volunteered.